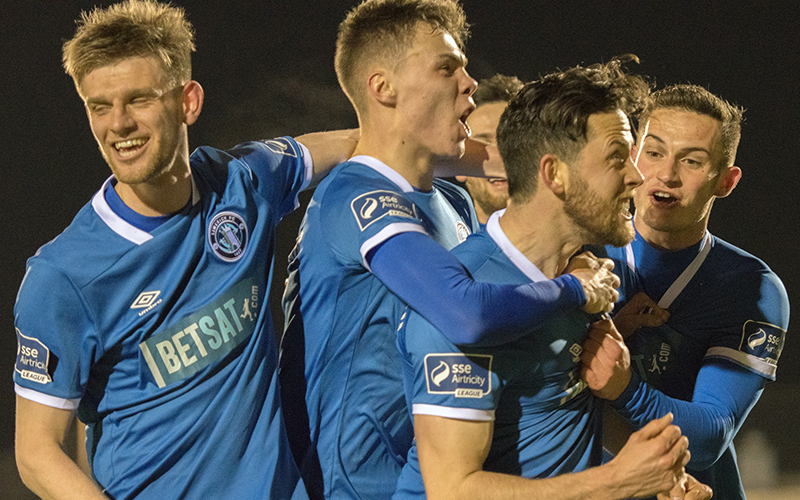 Billy Dennehy’s piece of magic secured Limerick a fully-deserved point in their Munster Derby with SSE Airtricity League Premier Division leaders Cork City, with Tommy Barrett’s side fighting all the way for each other in a 1-1 draw at the Markets Field on Friday night. Listen to audio reaction, below. Loud from the outset, noise levels in Garryowen soared past the quarter-hour when Dennehy broke through midfield and sent a low well-placed shot into the bottom corner, to give the Shannonsiders a lead that their early endeavours merited. Against the run of play, Cork almost found themselves back on level terms when Gearóid Morrissey hit a first-time effort from range that saw Brendan Clarke produce a brilliant reaction save to tip over. The 2017 double winners were back in it, though, past the half-hour when Darren Dennehy was adjudged to have pulled down Graham Cummins from a corner. Kieran Sadlier took on the responsibility and coolly converted. Cork did begin the second half better, but it was Limerick that looked the more likely, and on 61 minutes Shaun Kelly’s thunderbolt was pushed over by Mark McNulty, who had to come to the visitors’ rescue again close to the end when he denied substitute Karl O’Sullivan. 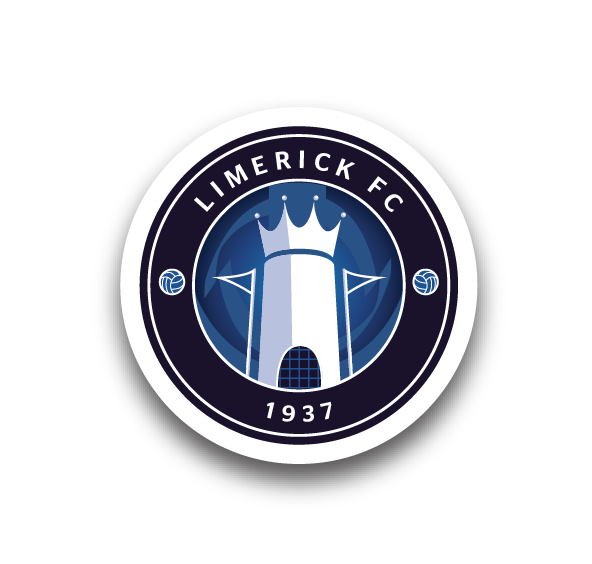 Then, in the dying seconds, it was the turn of Clarke who performed heroics to stop Sadlier’s powerful free-kick from just outside the box, which maintained Limerick’s unbeaten start to the season at the Markets Field. For the game, manager Tommy Barrett made two changes to the team that lost 5-0 in Derry last Monday as Shane Tracy and Eoin Wearen were replaced by Kilian Cantwell, who took up a midfield role, and Billy Dennehy who moved to left-back for the first time. 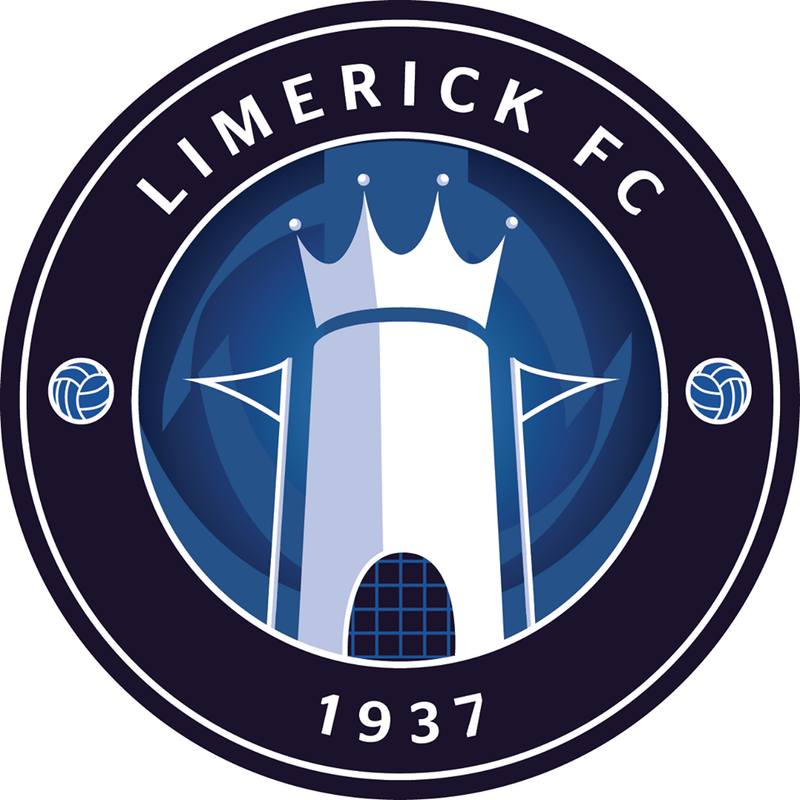 Limerick, like in the North, started brightly and they had their first real opportunity on nine minutes when Dennehy got down the left and delivered for Danny Morrissey at the back post, the striker knocking the ball into the path of captain Shane Duggan but from inside the box he skied his effort. Right-back Shaun Kelly put in an outstanding display for Limerick (photos: Ivan O’Riordan). 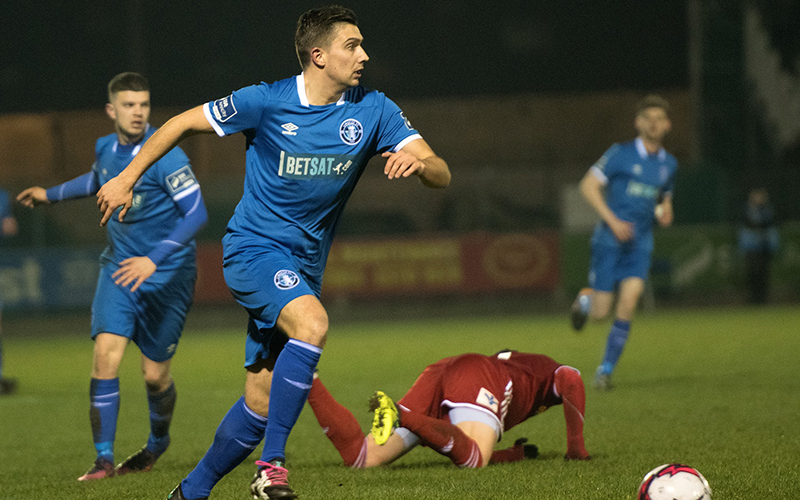 The Blues deservedly hit the front on 17 minutes when Dennehy raided through the centre of midfield and, with men either side of him, he decided to take it on himself as he planted a low 20-yard strike in the bottom corner beyond the reach of McNulty. Cork looked for a response but Limerick were dealing comfortably. Then, out of nowhere, Clarke was called into action on 26 minutes when the ball broke invitingly to Morrissey 25-yards out and he hit a rocket of a shot which was bound for the top corner only for the Blues stopper to get across and brilliantly tip it over. On 32 minutes, Cork were given a way back into the game when Darren Dennehy was adjudged to have fouled Graham Cummins following a corner, and up stepped Sadlier to coolly send Clarke the wrong way and level the scores. Before the break, Karl Sheppard headed a Conor McCarthy cross over, and then Barry McNamee threatened twice with a dangerous free-kick flashing just past the post before a curling effort from the edge of the box was gathered by Clarke. At the break, Barrett was forced into a change as Kearns suffered a thigh injury late in the half and was replaced by Will Fitzgerald. And it was Cork that began the better. Still, they did not seriously trouble the home defence. Before the hour, a fine run from Fitzgerald eventually earned a free-kick out on the left, and Billy Dennehy’s delivery found his brother Darren at the back post but from a tight angle he hooked over. Then, Kelly found himself in space outside the box and he took on the shot, his effort dipping all the way in but McNulty got a hand to it to push it over. Kelly put in an impressive second-half performance and shortly after that strike, he delivered a cross for Danny Morrissey who headed off target. At the other end, Shane Griffin got into the area and laid the ball into the path of Karl Sheppard whose low shot was held by Clarke. Griffin threatened again soon after but a brilliant perfectly-timed tackle from Kelly stopped him in his tracks. With two minutes remaining, Limerick looked to win it when substitute O’Sullivan broke through, gliding past bodies, and from the ‘D’ he sent a shot which McNulty could only gather at the second attempt. In injury-time, Cork had a chance to take all three points when they earned a free-kick just outside the box. However, Sadlier’s fierce free-kick was met by a wonderful save from Clarke who got the strongest of hands to it to keep it out, as the sides settled for a point apiece. Limerick: Brendan Clarke, Shaun Kelly, Tony Whitehead, Darren Dennehy, Billy Dennehy, Danny Morrissey (Karl O’Sullivan 67), Kilian Cantwell, Cían Coleman, Shane Duggan ©, Daniel Kearns (Will Fitzgerald HT), Connor Ellis. Goal: B Dennehy (17). Booked: D Dennehy (32), T Whitehead (48), S Kelly (62), C Coleman (71), B Dennehy (90). Unused Subs: Tommy Holland (GK), Henry Cameron, Shane Tracy, Killian Brouder, Jeff McGowan. Cork City: Mark McNulty, Conor McCarthy, Seán McLoughlin, Aaron Barry, Shane Griffin, Karl Sheppard, Gearóid Morrissey, Conor McCormack © (Michael Howard 80), Kieran Sadlier, Barry McNamee (Jimmy Keohane 70), Graham Cummins. Goal: K Sadlier (33 pen). Booked: None. Unused Subs: Peter Cherrie (GK), Danny Kane, Tobi Adebayo Rowling, Colm Horgan, Alec Byrne. Referee: Neil Doyle (Dublin). Attendance: 1,341 (Official).